How Do We Keep Them Safe? The feeling I have can only be described as “heavy.” My heart is heavy, weighed down by sadness for all the kids impacted by the school shooting that took place yesterday in my home state of Ohio. My head is heavy too; cloudy and confused by yet another tragedy involving our nation’s kids. There are so many things to feel when a kid becomes so desperate, or unhappy, or murderous, or lost, that he opens fire on a group of his peers. I think it’s natural to feel anger, but I primarily just feel sad. It’s a hard time right now for kids. And, consequently, a hard time for parents as well. What do we tell our kids in a time when the gap between the haves and the have-nots is so great? When there’s so much pressure to look a certain way, to have certain things? I attended 12 years of Catholic school, which meant I wore a uniform for nearly every school day of my life. We were told that the point of these uniforms was to level the playing field, to take the focus off of which kids had more or less, thereby putting all the focus on learning. We had no cell phones, no iPads, no laptops. The only opportunity we had to distinguish ourselves was with our footwear. I spent a lot of time obsessing over my socks and shoes, putting just the perfect amount of scrunch in my socks and feeling on top of the world when I had the “right” shoes. But really, there wasn’t a whole lot of pressure. My head spins when I try to imagine what high school is like today. It seems that every day we’re hearing another report of a kid who was bullied so badly as to wish herself dead. Or a kid who felt so much pressure to succeed that his life was a private hell. Or a young man whose home life is so bad, he does the unthinkable. How do we, as parents, protect our kids in this confusing time? How do we help them navigate this complicated world? 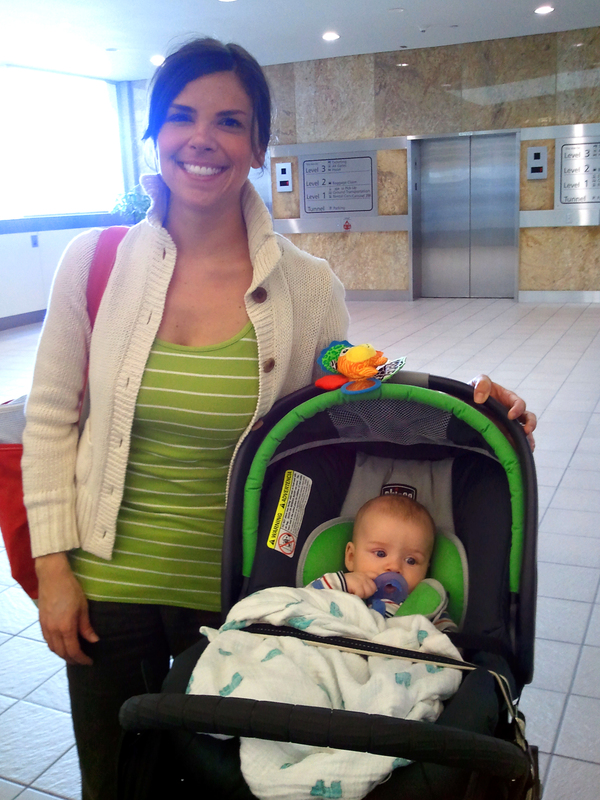 I recently took my 4 ½-month-old son on a plane for the first time. Overall, the trip was a great success. But during the flight home, we went through a 45-minute stretch of turbulence that was the scariest I’ve ever experienced. With my son sleeping peacefully in my lap, the plane began to lurch. The flight attendants scurried to their seats, the pilot instructed us all to prepare ourselves for a period of severe turbulence. I’ve been through turbulence many times before, and wasn’t fazed — at first. But then, things became more serious. The plane began to shake violently, and then suddenly dropped, causing me to leave my seat and strain against my seat belt. A collective scream rang out throughout the cabin. Ice and ginger ale rained down from above, as the woman next to me lost hold of her full cup. I gripped my son as tightly as I could, feeling more vulnerable than ever before. My god, I thought. How do I keep him safe? I didn’t know the answer to that question then, and I don’t know it now. At the time, I simply held him close. The turbulence passed. We weathered the storm together. And through it all, amazingly, he slept. Maybe I won’t be able to keep him safe throughout his life. Maybe I can only prepare him as best I can, comfort him when necessary and — from time to time, when the going gets really rough — hold him close. Posted in Life, Parenting and tagged keeping kids safe, ohio school shooting, parenting. Bookmark the permalink. It’s so scary and as they get more independent, you want to be right there behind them to make sure they don’t run in the street or fall off the slide. And now with my second on the way I’m even more scared then I was…I know more, I see more and I listen harder when issues involve children. I guess you just have to do what you said, hold them close when they need it. Christina, I can only imagine. Many congratulations on the impending arrival of your second! What a beautiful baby!! Great site. Very nice layout and good written content, nothing else we need :D.